We took a look at what it is happening with electric vehicles, EVs, and how this new change might be coming faster than you think. This is a computer chip. Chips are the bits in a computer that do the computation – the thinking if you like. They are effectively the brain. In 1965, head of Intel, Gordon Moore stated that computer chip performance would double every 18 months, for the next ten years. Think about that, doubling – every 18 months. It was incredible at the time, unbelievable, and everybody said it wouldn’t turn out like that. And, of course, they were right and he was wrong. So wrong. This chart shows chip performance from 1970 to 2016. Note that the left-hand axis is exponential. Chip performance didn’t double every 18 months for ten years. Chip performance has actually doubled every 18 months – for the last 50 years. It’s the kind of change that is almost impossible to comprehend, but without which, we wouldn’t have the things that we take for granted today, like smartphones. 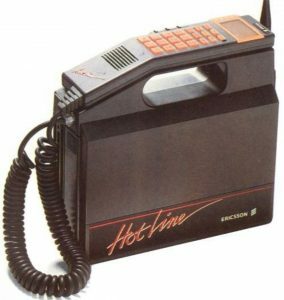 Talking about phones, many of you will remember the first mobile phones. 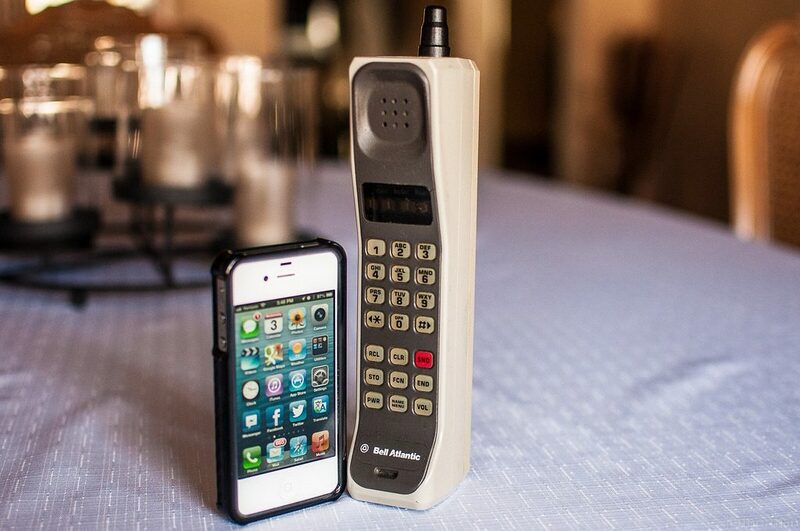 Here’s an early one compared to a modern smartphone. But this picture only tells half the story. 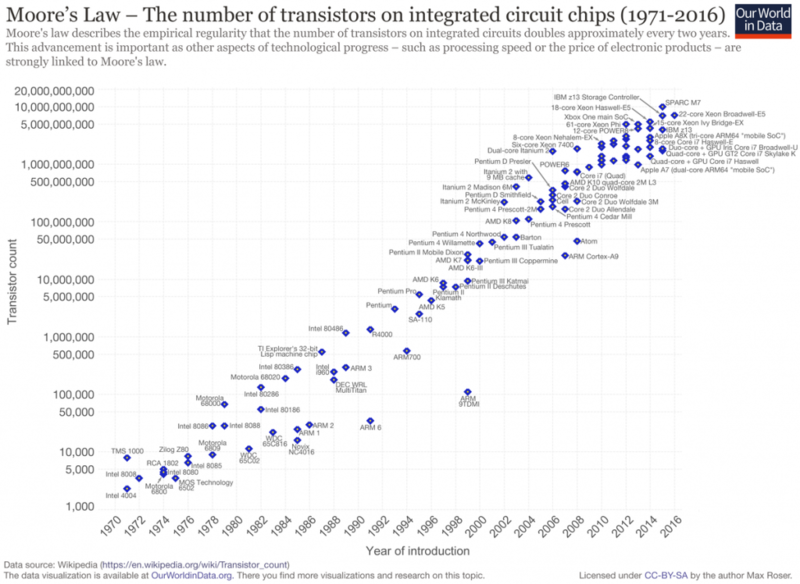 Gordon Moore’s prediction – that chip performance would double every 18 months – is known as Moore’s Law. Keep it in mind as we assess the future of EVs. But first, the key ingredient of an EV: electricity. You probably know that electricity from solar power is getting cheaper. But how much cheaper? Well, this much cheaper. 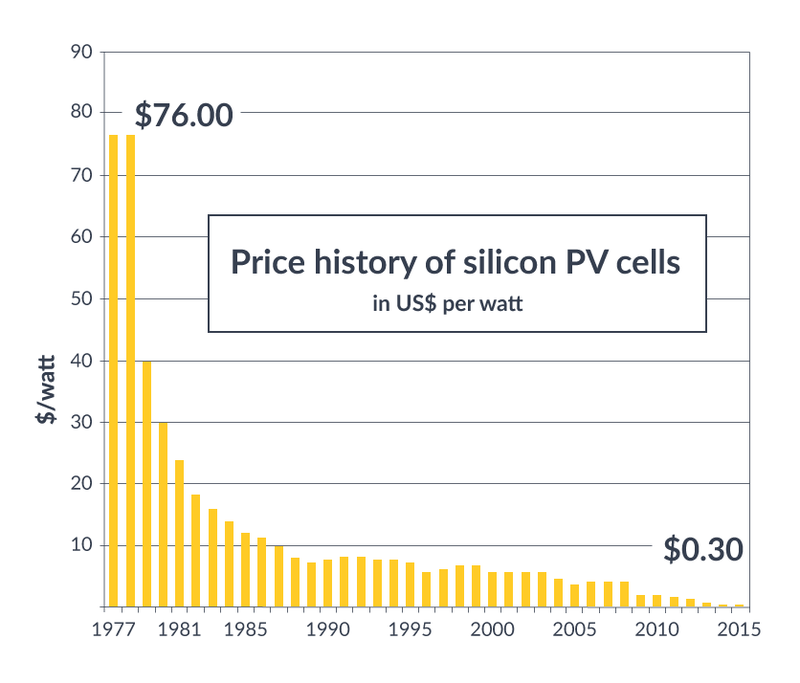 from $76 per watt in 1977 to 30c in 2015. In fact, solar power is cheaper than oil for producing electricity, and on average it is halving in cost every 2 years. 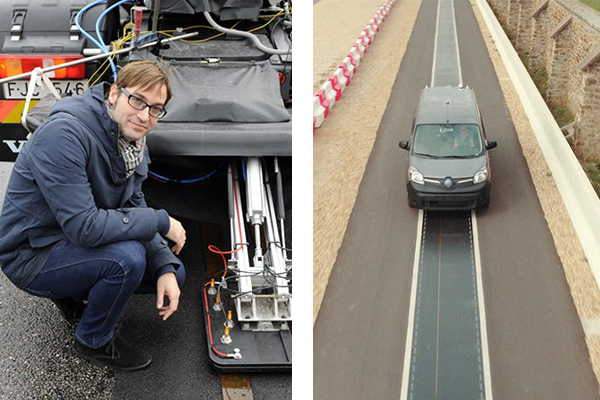 So, electricity, the fuel of EVs is getting cheaper – much cheaper. Battery storage capability is increasing rapidly, and huge performance improvements are predicted. But improvements in technology aren’t just about improving the components we have. They are also about totally changing how we do things. So, what if we didn’t need batteries? In the next 20 years, it’s predicted that we will be able to charge our electric vehicles as we are driving them down the road, so we won’t even need large storage batteries. You may have noticed something about these changes. They are all “exponential”. We are used to linear changes. A linear change is where something increases, or decreases by the same amount each period. If your weekly rent increases by $10 every year that’s a linear change. However, if your rent increased by 10% every year, it would double in 7 years. That’s an exponential change. This is what an exponential curve looks like compared to a linear curve. 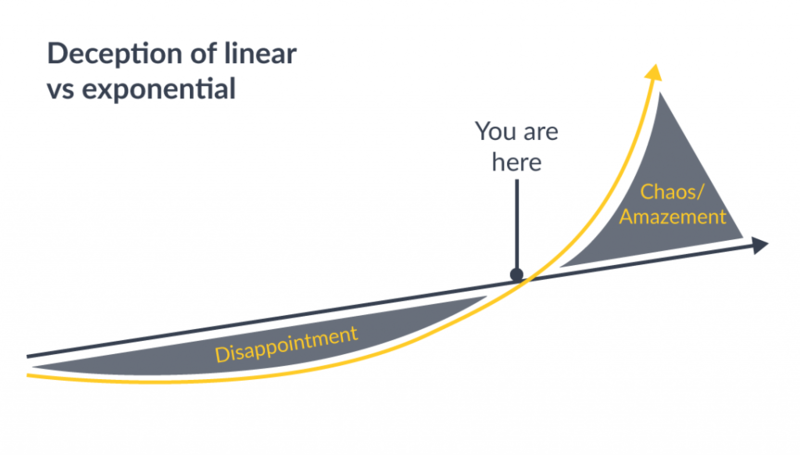 Notice how the exponential curve remains below the linear curve for some time (so it appears that nothing interesting is happening) before it suddenly shoots up. 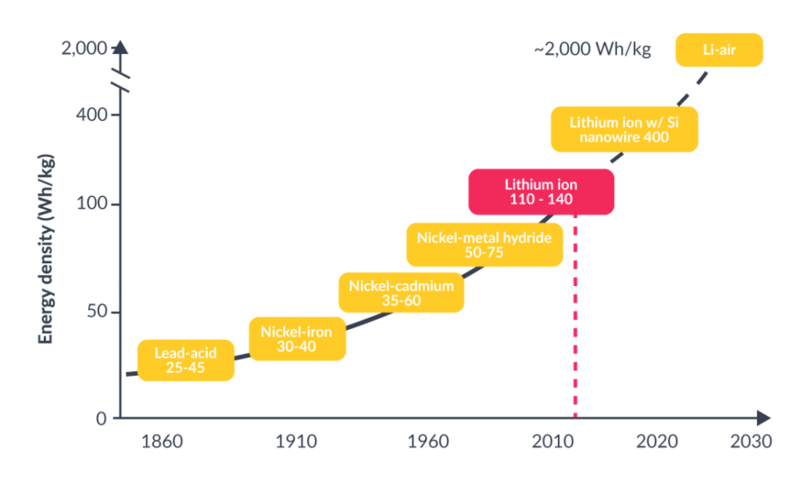 Moore’s law, the cost of solar power, battery storage, are all examples of exponential curves. But of course, none of that makes a difference if we don’t use the technology. So how quickly will we start to use EVs? 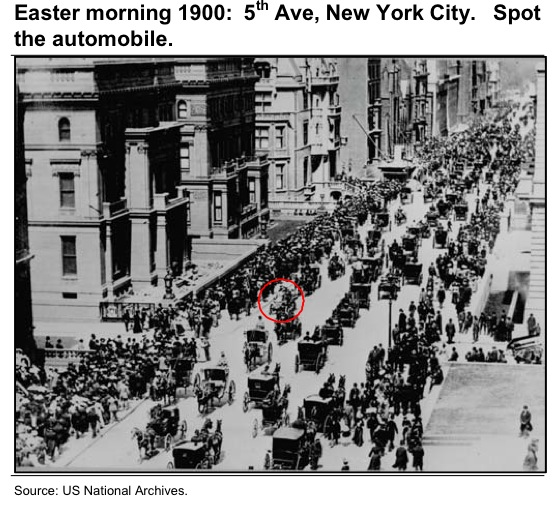 Well, let’s look at the adoption of new technology in the past. 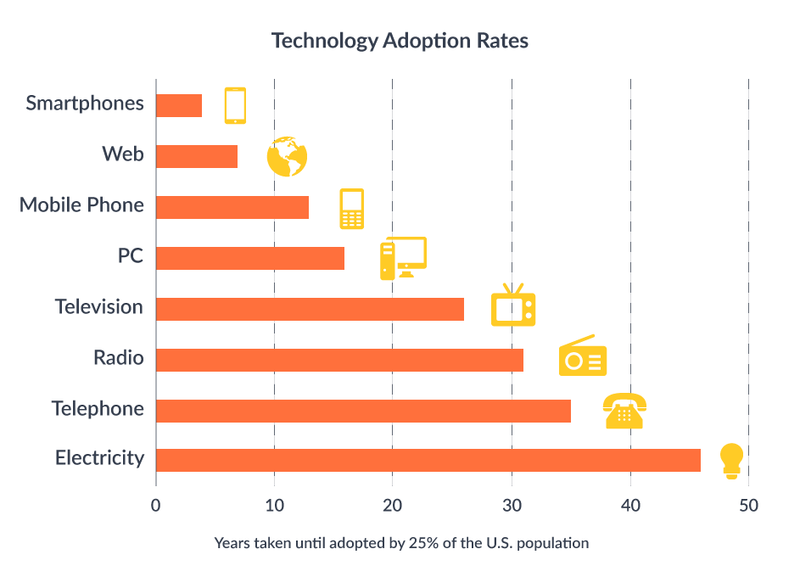 This chart shows how quickly 25% of the US population took up a given new technology. 45 years for a quarter of the population to start using electricity. A long time. But look how that changes as we move to more recent technologies: mobile phones: 13 years; smartphones, 4 years. Remember, the iPhone was first released a mere 11 years ago. And in the case of EVs, Governments, for environmental reasons, are going to give things a nudge. Norway is banning new petrol vehicles from 2025. Germany, The Netherlands, Ireland and Israel have a ban from 2030, while France, Taiwan and California have a ban from 2040. This is a plane. 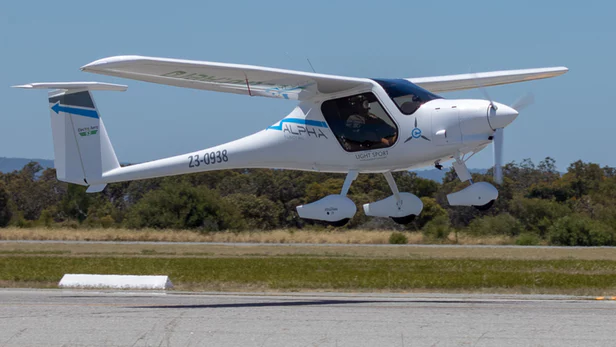 An electric plane. Norway is banning fossil fuelled domestic planes by 2040. But cars are expensive things and we aren’t going to throw them away overnight, are we? Let me leave you with two photographs. 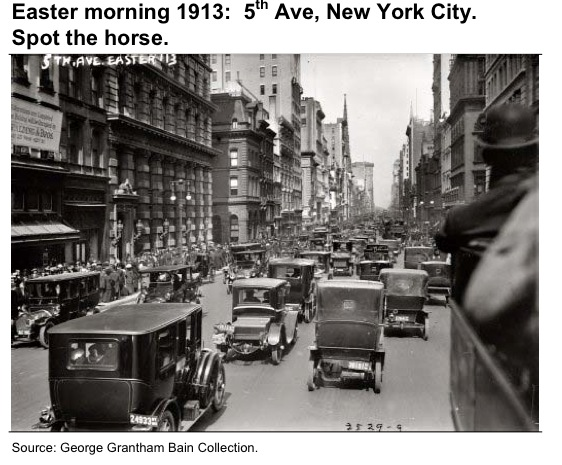 In 13 years, this streetscape moved from 99% horse-powered to 100 per cent petrol powered. There are around 9,000 EVs on New Zealand roads today (August 2018). But that number is increasing by 6%. Per month. That’s 100% per year. At that rate in around 7 years, there will be 1 million EVs on New Zealand roads. But what does this mean for you as you deal with today’s challenges in business? If, in your business, you are doing today, what you did yesterday, it will continue to be effective, until the day it isn’t – that’s what exponential change looks like on the ground. Let’s face it, you already know that it’s harder than ever to get sales and your customers’ expectations are changing – at an exponential rate. To be successful, you need to find breakthrough solutions for your customers. Problems that seemed like a fact of life for customers yesterday are no longer acceptable, and one of your competitors is going to find the solution if you don’t. That is the power and the challenge of exponential change. The good news is you can harness this shift, and create breakthrough solutions. If you would like a no obligation chat, email us hello@thinklazy.io.